Translations, scans and any other in-progress Last Exile related projects. Because I'm going to eventually do things here, too. o7 But as always like with the other threads, it's open season so if there are any other TLs done, I'd love to get as much on the site proper as possible! Here I am with the two pages on Dio and Lucciola - Page 1 and Page 2! The meeting of these two was promised. But Delphine had nothing to do with this fate. Dio and Lucciola are like two wings of a bird. One existence between two people. Dio called Lucciola a friend. Staying alongside one another is a natural existence, and they're a single irreplaceable existence to one another that they mustn't lose. Therefore Dio feared it. The ritual to become an adult means devoting everything to the Maestro, there's no friend or freedom in Delphine's sky. Lucciola called Dio his friend in front of Delphine. The Maestro of the Guild and everything. Other than loyalty to the Maestro, there is nothing. But Lucciola vowed to dedicate his life to Dio, from that day Dio called him his friend. Lucciola, in order to give Dio his freedom, fought against the Guild and died. But Dio, who had his heart crushed by Delphine, disappeared into the Grand Stream. Dio and Lucciola met when they were children. For the first time, there was a presence that eased Dio's heart. Dio worried and cared about Lucciola. Lucciola was deeply moved by it. This was the beginning of a relationship that went beyond that of a master-servant. The unbridled Dio got a taste of a life of true freedom on board the Silvana. But it was also a prelude to tragedy. The breathtaking dogfight between Dio and Claus. Claus being called Immelmann happened in this episode. "I've wanted to meet you, Immelmann." Dio's shocking words accompanied by him hugging Claus! The quality time spent with Lucciola gave Dio a sense of peace. And Lucciola responded to Dio's feelings. Then, having a birthday party with his friends was one of the best times in his life. Upon completing the mission, awaiting a Dio who was in high spirits ... was Delphine. Dio couldn't help hitting Lucciola in his feelings of frustration and despair. The ritual of adulthood killed Dio's free mind, leaving no trace of his former, bright self. However, Lucciola still faced off against his brother in order to save Dio. Though Dio had his heart and his memory taken away, Lucciola did not forget those happy memories even at the end. Lucciola's feelings reached Dio's heart. The scene where he strikes out at Al expresses the depths of Dio's anguish about his birthday. The scene of the warm birthday party was the last moments of peace. Ethan's original birthday song is also a highlight. Despite the exchange of his life, Lucciola fighting Cicada in a flowing-like elegant duel is an outstandingly excellent scene. Tara wrote: Those might be good enough, thanks so much! Unless someone else faster actually gets to it, I'll PM you if I need any potential like, close ups of sections or whatnot! They'll be HERE whenever they're TLed, hopefully soon! -- UPDATE 2 -- Second half of page 54 and page 55 coming soon. It would be nice if somebody could fix my English. -- UPDATE 3 -- Translation completed. Such a huge amount of information was put into the making of “Last Exile” that, I believe, It is possible to say lots of viewers suffered from indigestion. Here, we are going to discuss with our three guests the work behind the scenes that led to the creation of the main story, its incredibly detailed chara design, as well as to clarify some general aspects of the plot. IN: First of all, please tell us about the original plan for this story. Chigira: At first Mr. Murahama outlined a rough draft for the story (note 1). It was about the pure love of a bad guy who was fighting on a battleship. As already stated in other interviews, from there I began to develop the story with Alex as the hero and I had progressed to a good extent when our producer, Mr. Birukawa [Hiroyuki], questioned me on “what I really wanted to accomplish with this work”. To tell the truth, considering the age of the viewers I wanted to reach, I had already some ideas on my mind: I wanted to not only show the “world of men” but also to give an overview of the characters’ everyday life. IN: Well, besides being the amazing flying kids, I think that Claus and Lavie have also the purpose to show us the everyday life of this unique civilization that replaced the sea with the sky. Suzuki: The original story concept placed the setting for the fights among battleships in the outer space. In fact, before this project I had developed the setting for Vandread, so I thought I could reuse some of that material. However Murata pointed out that it was impossible to have musketeers exchanging fire in outer space, so he suggested the sky was a better place for the setting. Chigira: Therefore the whole picture changed and it was a good thing as this also provided the right setting for those kids and their lives. Indeed we liked the image of a small silver vanship flying in the blue sky and through the white clouds. IN: However, scenes that are easy to draw in outer space are more difficult to draw if there is air. For instance the hair and the hem of the clothes have to move according to the winds, the wires hum with whistling sounds and animating all that is more complicated. Chigira: For that reason the realistic chara design created by Mr. Murata highly contributed to make that universe alive. To say, that choice in the chara design and its distinctive feature eventually contributed to the visuals of the world of LastExile. Indeed, for an illustrator that was a hard task, but looking at the high quality of his work to the point that you can really “feel” that world, it makes him really proud of what he has created. IN: The choice to make Claus and Lavie young kids made this world more enjoyable for the intended audience, yet at the same time it was possible to show a more adult world, which was the original purpose. Even watching this show without any deep knowledge, it is easy to see that it is based on the society and the science before and after the First World War, as you put right from the beginning airships floating like balloons as to declare “this is a world dominated by swirling winds”, then with a sudden change we are taken back to the ground to see the enthusiasm of Claus and Lavie for a minor race, so all in all it was a nice way to introduce the viewers to this world. IN: On the contrary, since the preview gave a quick overview of the whole world, as soon as it ended lots of questions rose as big as mountains. Looking back at the model sheets, there is so much material that “could not fit in”. I don’t mind it since I eventually came to understand the story, but I feel like some specific details were omitted because of lack of space. For instance, it is not possible to understand the “LAST” thing [of the title] either after two episodes or after five, so I’d like to provide some additional explanation to those people who read this book. Chigira: I am sorry. Although it may be true that it is not possible to get a clear understanding of everything after watching the show, basically that’s because I tried not to tell everything at once, as I wanted to show the world through Claus’ eyes. What to show of a character, how to show it, how to make him act was based on that assumption, so there are details from the model sheets that were omitted. But the same can be said about Claus, and that made the storytelling more complicated. This is an original story after all, so there is no predefined guideline. We made this choice, although we were not sure it worked… I mean, starting with Claus as an absolutely honest 15-years-old boy who moves through the story till the end. IN: A pure soul indeed. Most of the adult people have lost sight of justice and of what they should protect, it seems like they do what they do just because they have to. Chigira: And there comes the part where I wanted to show that the actions of “that” Claus play a key role in this world. Suzuki: Whereas Lavie had a deep desire for a simple happy life, which I personally liked the most. I think that’s where the Director’s inner conscience appears in the show. Chigira: The fact that a vanship is a two-seat aircraft is at the core of this story. It is a machine that cannot fly without the two, Claus and Lavie. I wanted not only to show the deep bond between the pilot and the navi, but also the fact that flying in a vanship is not something you can do by yourself but it needs cooperation to achieve what you aim for. To say, the story cannot move forward either with Claus alone, or with Lavie alone. ★ At this point Range Murata shows up. Although he was very busy, he was able to attend [this interview]. IN: In an event in America there were rumors (from GONZO’s staff) about a sequel. Chigira: Then you should ask Mr. Murata and Mr. Kobayashi for the details, please (laugh). Murata: But at the moment it is not as developed as you’d expect it to be (laugh). Chigira: If so, then let’s decide and write down the plot right now (laugh). IN: Now, let’s go back to the original project. The characters Mr. Murata drew needed to “feel” the wind, so the setting for the story came from that. Murata: Well, they would not work well in outer space, so I simply said they needed the sky. Chigira: Mr. Maeda’s initial vanship design had a sealed cockpit because the setting was outer space. Murata: But when the idea of outer space as the setting was abandoned and the sky replaced it, I could draw inspiration from my favourite Messerschmitt car (Note 2) and put some details from there into the vanship design. Also, with space suits I could elaborate the outfits less, but with flying suits I could bring into their design the ambience of the pre-industrial era. With the sky as the setting, then a character like Claus was needed. If it had been outer space, I believe that Alex would have been sufficient to develop the story. IN: The industrial equipment is more like industrial-art equipment. When I looked at the precise movement of the needle of the altimeter, I realized “Ah, even without electronics it is still possible to fly”. Murata: The 8 [hours] endurance [race] was as realistic as possible, so I wonder if even those who are not familiar with mechanics could understand it. Al drawing lots was a gratuitous scene by Chigira, though. IN: Back on topic, I heard that Mr. Murata had decided the character design from the beginning. Murata: Oh, not really. At first all the details of the story were not fixed yet, so I was told it revolved around Alex and his life devoted to battles. As soon as I created his character design I submitted it, however the scenario for the story had already changed so they hurried me to introduce some corrections. All the crew members of the Silvana needed more “modern” outfits than those of the people from Anatoray or Disith, so their military uniforms were inspired by the industrial revolution era. They resembled those of the special forces who receive the most advanced equipment, like experimental units. Although I adapted the design - originally intended for the outer space - so that it looked good for the sky, the 3D staff introduced techniques to draw the sky and the clouds that I was not familiar with. Therefore some already finished characters and mecha did not integrate well and had to be redrawn. That’s when I turned to Mr. Chigira for a consultation. Chigira: We talked about what we wanted it to look like and came up with various sketches to make it looking awesome again. Indeed the setting was difficult to work with, but I am glad we chose the sky. Murata: To make the fight scenes look great on screen I thought that the sensation of speed is the most important one to give the true feeling of flight. If you think about it, it is impossible to do it in space, that’s why I strongly insisted to move the setting to the sky, where a small fast aircraft like a vanship can give the actual sensation of speed. In fact, it is the movement of things in the background that produces the sensation of the clouds and the sky moving. The 3D staff worked hard on this. I only identified this opportunity from the start, but it was the effort of Mr. Chigira and the staff that eventually transformed this idea into reality. Chigira: That would have been something extremely hard to accomplish in the past, but at that point with the 3D we were able to properly include the moving clouds background. Murata: Small ideas were continuously coming out because Mr Hirata (Note 3) almost every single day showed up and insisted in telling me “I made this” about the opening. IN: Even looking just at the scene on the landing deck, it makes you realize it is a critical operation because you have aircraft floating in mid-air. Murata: That maneuvre is impossible if you fly only by dynamic lift. In outer space such a critical operation is quite complicated. Here I wanted to reproduce that sensation of floating. Chigira: The opening became the touchstone for our work. Since it was so packed as to say “let’s show everything at once!” it put the staff under pressure, although in a good way. Murata: Until then, most of the staff did not know what kind of setting we were working on, so I think that the opening footage was able to provide a common view to the whole staff on what we wanted to actually achieve. That’s it. It was a good thing that Mr. Hirata sat next to me. Seeing his work in the making, I could really talk about many things, for example the movement of the clouds. Since it is water vapour, I wanted it to move in a certain way. In that case Mr. Hirata exclaimed “No no, it’s better this way. Forgive me for today”, so I fixed the movement the way I was told, working very hard till midnight and then I came back to him earnestly asking “what about this”. It was a really good thing that we could help each other like that. Chigira: He changed it completely despite saying “I fixed it slightly”. Murata: Seeing the clouds moving and the wind blowing during the opening I felt like I had to keep up with that example so I remade the design, also the 3D group did the same so it seemed like we were competing against each other. I really wanted to make something at least as good as theirs. 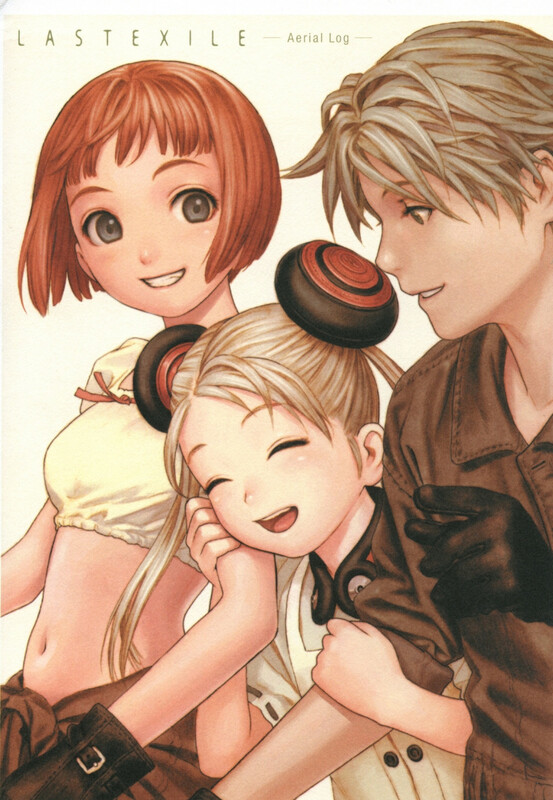 Chigira: Oh yes, all the people involved in LASTEXILE worked with such feelings. IN: Why did you choose to entrust Mr. Hirata instead of dealing with it by yourself? Chigira: There is always a lot of work to do before the airing. You can’t do it all by yourself. That’s why it is fundamental to involve other people. On the contrary doing it all by yourself will eventually take you to a standstill. Looking at how things usually end up, if the director spends too much time on the OP and ED the rest of his work is delayed, so we came to the conclusion to leave them to the other people so that I could focus on the rest. Nevertheless, it happened that the first episode was late, so I had to ask Mr. Hirata for help. Murata: I remember. The script of the part A of the first episode was completed on January 6th. Chigira: I remember it well, after all it just happened last year (laugh). Murata: Yes, how can I forget it (laugh). Suzuki: Looking at the actual work, episodes 1 and 2 took longer than the rest of the episodes. Murata: For instance episode 4 had few characters appearing and the script was prepared in advance rather quickly, however at that time the characters for episode 1 and 2 were not ready yet. So when the script for episode 1 came out it startled me that all the characters from the Silvana had to appear already. There were even characters nobody asked me for, so I almost wanted to die. At first the crew members of the Silvana had low priority because they were requested at a later time, but then the production told me “please provide all the crew members as we want to show them all from the very start”. That surprised me for sure as I replied “Nobody told me about that before”. IN: After all, you had planned just a business meeting in Tokyo but you intended to go back home, didn’t you? Murata: On the contrary that restrained me from going back home for a whole year so when I eventually returned back home all the houseplants had withered already. There was no green when I arrived. A heavy sacrifice indeed (Note 4). IN: The fact that the production was working almost in a rush to animate things in parallel up to episode 4 would make me think that the opening was some sort of conceptual summary, but now you are telling me that the episodes were produced with the opening as a model. It’s quite unusual, isn’t it? Chigira: Episode 3 requested a total of 2 weeks drawing, but with Mr. Murata introducing some corrections along the way. In a sense Mr. Murata’s product supervision is everywhere. Murata: There were many scenes in which I had to draw key frames in the middle of the editing of the layout. It seemed like there was no way to fix them as they requested more time and effort than expected. 24 hours had not been enough, so I had to stay at the studio another day to take care of the editing, being the designer. It was the first time I personally experienced a hard time like that (laugh). IN:　There were many things everybody could understand even without knowing the model-sheets. Being a gunman like Mullin was a traditional and historical job, however I thought that a free Vanship courier was a completely new type of job that could be understood only watching that incredible animation. Murata: The Vanship courier job was intended as being about ten years old. I wanted to provide some more details about it. This part took longer than expected. I am not completely satisfied with the translation, yet it is the best I could come up with. IN: The mecha design is quite accurate, down to the smallest detail. Murata: Mr. Kobayashi, who worked on the mecha design, seemed particularly worried before entering the Exile [project]. Although he liked the design of the Vanship very much, considering all the content he had to work on, he almost had the clear perception that it was a tremendous workload. To draw so detailed model-sheets was no easy task at all, so he took his time thinking about it till the very last moment. Suzuki: The detail put into the Vanship instrumentation is one example. The need for consistency and logic are apparent on all the model-sheets. It’s just that if you start drawing model-sheets in this way, you have to keep up to such quality standards for the rest of them. Murata: There is no cheating when it comes to machines. Just seeing things adapted into devices of this world, whatever principle they are based on, the viewer knows that it should move in this way or work in that other way. You look at an old car and you immediately know how it works. So, even if it’s just animation, it’s not that simple. I think that Mr. Kobayashi has the amazing ability to create model-sheets where the mechanics can be understood just looking carefully at them. He’s the best at that. For example, if I ask him to draw a gun he comes up with a model that really functions as a gun and at the same time is unique to that world. From a simple description of the settings he ponders over it and determines if a functionality is possible or impossible, how far he can go and where he must stop. It’s quite interesting that also Mr. Maeda had the same ability, so he produced a set of incredible model-sheets as well. “Mr. Renji, this indicator is from a Bugatti (note 5), isn’t it?” he said as he immediately recognised some vintage stuff. Suzuki: That’s right. Mr. Maeda asked me, being an expert [on military stuff], “What about the Silvana’s deck?” to which I answered explaining that “It’s an armoured iron deck mooring small aircraft”. With that simple piece of information he realized he needed to draw the housing for the mooring wires. He had a perfect understanding of how this world should look like. Murata: Yes, yes. For example, with Mr Kobayashi’s sketches of the vanship during maintenance, Mr. Maeda’s description of the Silvana, we took our time to discuss the mechanics so that we could agree “let’s do it this way” and draw things quicker. Being in charge of the characters, it was interesting that we could figure out things together. Both of them were quick workers. An amazingly precise picture came up in about 1 hour and I was surprised to be asked “what about this?” while still drawing some characters. Chigira: That’s right. Every time I saw them coming back to me I could only think of their work as SO COOL, SO COOL. What an attention to detail, they were not just sketches. They were so good. Murata: Both of them, that’s right. Their works were already completed the way they were. The side views of the vanship that I had drawn were combined into three-dimensional drawings that eventually got converted into CG solid models, which is something I myself could not really do. IN: They are like a human CAD, the way you describe them. Suzuki: Take whatever you can think of in the world, there are people who, starting from a single photograph of it, can quite easily recreate its three-dimensional model in their head and draw it from any perspective. Murata: I cannot do that, usually (laugh). Chigira: Mr. Maeda at one point drafted a scene depicting the taking off and landing from the rear deck of the Silvana from a certain perspective. He started to figure out in which way to draw it, thinking hard about it, then after a while he exclaimed “Ah, is it that?” since he had understood it. That sounds like coming up with the solid model inside your head (laugh). Murata: Although this makes it harder to draw the characters, I can draw them from any perspective since they are my creation. But being able to do the same with a mecha from a single view is something I consider fascinating although beyond my ability. IN: The emotions brought by the power of the visuals contributed a lot to the appearance of this world. Chigira: Well, when I saw that kind of dedication, I decided I could concentrate on the story. IN: Do you think there is something missing? Chigira: Well, it’s a shame that after Alex was crucified with the roses we could not place a scene where he could meet Claus. We envisaged a scene where Alex could tell Claus “Your father was a great vanship pilot” but there was not enough space to fit it in so we omitted it. Murata: Really disappointing. Alex respected Claus’ father so much that it was a pity we had to leave out a scene with Alex showing how regretful he was. IN: With that, maybe Alex’s decision to entrust Claus with all the Mysteria might have been better understood. After all it’s Alex’s will that a carrier pigeon is sent at a later moment or that Claus is given the message tube, although no word from him is attached. Chigira: Sure, they were on the same ship, however it was a huge ship, an unknown place where it appeared so unnatural for the two of them to meet, so I left it out although I was holding back my tears. Suzuki: Alex is a taciturn character after all. Murata: But he can talk (laugh). IN: The fans are still firmly rooted. It seems like the opening of an invitation-only event. Murata: I’d better go, before they spot my face. IN: Since Mr. Murata is so popular, he is recognised wherever he goes so he cannot move freely. Chigira: Yeah, so what if I go before they find out (laugh). Suzuki: Doesn’t the DVD liner add to that, which implies that Coccinella and the others rescued Dio? Chigira: That’s right. At the cast party I declared to the voice actors that in case of a sequel it would most likely be about Dio’s counterattack (laugh). Moreover Al would be three or four years older, which means she would change a lot. That’s because as girls grow older, they change the most. IN: Is there any chance it will be serialised? Chigira: It’s a secret (laugh). IN: By the way I’m pretty confused by some age inconsistencies, so how old is Al? Chigira: She is 9 years old. IN: Isn’t the daughter of Mad-Thane younger than her? Chigira: She is absolutely 9 years old. IN: Indeed, an incredibly good military nurse for a 9 years old girl. Suzuki: Well, a different take on this came into play from the producers’ side… Mr. Murahama also said about Sophia that “the viewers won’t like her if she is older than 20” (laugh). Murata: Well, no way she is 19 years old (laugh). Suzuki: Actually, in the liner notes she is a self-proclaimed 19 years old. However, even taking into account the special youth section of the military academy, she should be at least 25 years old. Murata: As for the other characters I created, I assumed they were about 27-8 years old. For Lavie however, I deliberately lowered her age to 14, so this is undisputed. IN: I think that making Claus and Lavie still underage was the perfect choice to support the development of the story. That age is ideal in that you can easily cope with new things and changes. Chigira: Lavie was a straightforward character, who spoke for my feelings. Claus was a more serious character, But Lavie was perfect to show the everyday life. IN: After listening to a frank discussion like this, I wish there were 5 or 6 more episodes. Suzuki: I actually wanted to run the show for one year altogether, although everybody kept telling me that nowadays it is impossible to have a late night [anime show] running for a whole year. That’s why I stretched it as much as possible and made it into two seasons, but it appears I could not fit everything in it, after all. Chigira: In the end it was a pleasant job. I had to be very responsive while taking care of the direction. I had to manage many changes with both the Planning [team] and the Producers. That of supervisor is an unexpectedly delicate role in the process. There is the hardship to reject somebody’s view because of someone else’s good points. So his role is to guide the discussion with his persuasive powers. In fact it was a job that provided a continuous sense of tension as if everything would be lost if you messed up things. However, it was a job I myself was strongly used to. Murata: We were under a terrible pressure. There was a sort of strong aura surrounding Mr. Chigira that made him hard to approach. Whenever I had to go to the desk of Mr. Chigira first I asked the lady from the production “Hey, how is it going these days” to calm down a bit, then UGH! I had to go and face him. Chigira: That sounds like I have a bad temper. There is no reason to be that scared (laugh). Murata：Not at all, since the storyboard was carefully examined I used this approach until it was over, it was a habit of mine. After all, wasn’t it hard to approach the desk of Mr. Horiuchi (note 8) as well? Tanno (note 9): Because the rooms are also different, like the difference between a smoking room and a no-smoking room? Mr. Horiuchi was a serious person who, although very busy, took care also of all the copyrighted pictures to be included into the anime magazines. Chigira: He was strict both with himself and with the others. Murata: Although being strict on deadlines coming in 2 weeks, he has the ability to instill the feeling that if I can do it, then you can do it too. IN: There are no parts that are actually obscure or that have any inconsistency if compared to the model sheets, nevertheless it looks like many scenes were omitted because of time constraints, which I believe was a waste. IN: Anyway speaking on the audience’s behalf I think that, contrary to the others, the last episode is so packed with stuff and the time is flying to the extent that it would be difficult to understand it if it weren’t divided into a first part and an epilogue (everybody laughs). Chigira: Yes. However I wanted to give more or less a final picture of what was going on. It’s quite long though. Murata: Actually the transition from Prester to Earth was the turning point. Chigira: We showed the alternating of the four seasons, the ocean, and the passing of time on Earth. Well, that’s a sequel in its own way, albeit insufficient. IN: I already asked but, any plans for a sequel? Chigira: I am often asked this, but this was a large work so I cannot come up with an ordinary sequel. Indeed, that was a turning point in GONZO’s history, so it is certainly difficult to improve if we don’t create something great. However by all means it’s something I personally would like to do, so I think a lot about it. IN: We’ll be looking forward to it. Everybody: Please look forward to it (laugh). IN: Today this has been a very busy event, thank you very much. Note 1: Mr. Murahama is the president of Studio GONZO. Note 2: The three-wheels compact car that the Messerschmitt company, who also built the old German fighter Me-109, designed in the 1950s. Note 4: Mr. Murata lived in Osaka and came to Tokyo for a business meeting, however he started to work on that very day and so he could not go back home. Also, since his house was had metallic interiors it appeared extremely cold without houseplants. Note 5: A French auto maker, named after car designer Ettore Bugatti. Bugatti's are characterised by outstanding performance and a unique style, so they are considered “running jewels”. Note 6: In the model sheet it is stated that her physical age is 11, whereas her mental age is that of a 9 years old. Note 7: The frightened attitude she showed in the first episode is in line with her being 9 years old, however the hardships she faces in the second half of the story make her mature, so she seems older than Al. Note 8: Osamu Horiuchi, character design animation. Note 9: [Hideki] Tanno, GONZO Copyright Manager, arranged Mr. Murata’s appearance in today’s session. He is also in charge of Mr. Horiuchi’s, so in the end he is the one who worked behind the scenes. Note 10: 1 half-paper is a manuscript of about 200 characters, however in ordinary anime production it is usually of 70 characters. Last edited by -TK- on Sun Dec 04, 2016 11:25 pm, edited 1 time in total. I took a quick look but edits seem minor. For example in note 5, could change to "A french auto maker, named after car designer Ettore Buggati. Buggati's are characterized by outstanding performance and a unique style..."
Woah, I didn't realize this was all here with the edits! Great job so far (and so fast, I've been so ... bad... with TLing things) Once you finish up I'll scooch the stuff to the Aerial Log TL section and add it all to the site when I upload the next backlog of things. Editthesky wrote: I took a quick look but edits seem minor. For example in note 5, could change to "A french auto maker, named after car designer Ettore Buggati. Buggati's are characterized by outstanding performance and a unique style..."
Thanks for your suggestion! Please let me know if other parts need some improvement! Tara wrote: Woah, I didn't realize this was all here with the edits! Great job so far (and so fast, I've been so ... bad... with TLing things) Once you finish up I'll scooch the stuff to the Aerial Log TL section and add it all to the site when I upload the next backlog of things. Yeah, I preferred to edit my post instead of making new ones. But the translation is far from perfect... there are some passages that need a cross-check. Chigira: The screenplay had about 100 half-papers (note 10), so we made a selection where many of them were scrapped. Edit: "we made a selection where many of them were scrapped" -> "we produced a revised screen play in which many pages were scrapped." Edit: "speaking on the audience's behalf" -> "speaking for the audience"
"packed with stuff and the time is flying to the extent that" -> "packed with stuff and moves so quickly that"
The only value Guild agents are permitted to have are complete loyalty to the Maestro. But they do not think to doubt it. Because they do not know "freedom" outside of the Maestro's rule. They do not know "freedom" which is important to humans, in order to carry out the acts to maintain the Guild's system. And devote their lives to the Maestro. Cicada stands at the top of the agents, even trying to eliminate his genetical younger brother. All for the Maestro. The colors change the higher the order an agent is in, ending in black. Does this give a feeling of an innocent heart that gradually turns black and discolored? Agents who support the Maestro. Cicada is the only one permitted to wear black, the color of Lorcia. For them, the Maestro's existence if everything. If it comes, they are willing to serve as a shield to the Maestro. While Cicada's subordinates are waiting, Coccinella hands a weapon to Lucciola. It's a scene where a delicate temperature difference can be seen. The females who serve Delphine also join the battle. At this point, Delphine has lost most of her servants, and was engaged in capturing the Exile. The battle style mediated by the Guild are a highlight. You can also see the changing situation in the Guild. The description of the technical officers who control the units are interesting to compare to Dio, who is celebrating his birthday.